Currently, I feel blessed, I feel lucky, I even feel lighter having witnessed the manifestation of human intentions, aligned with a divine reality. To build a temple like the one I visited today: the vision, the money, the man power, just wow. I was briefly schooled on what not to do while in the temple: no PDA, no extreme laughing, no photography. If you know me, that 2nd one might be tough. Also, what to bring: an offering, fruit or flowers. My boyfriend did not say anything about a dress code other than the phrase “business casual.” With no time to research anything, I put my trust in him. Greeted by great gates, and a winding driveway, we made our way to the temple which was recently constructed, but not yet finished. He commented, “We’re the only “gringos” here! Are we supposed to be here?! I don’t want to go in.” I assured him that they will be welcoming: Hindus See God in Everybody. I hardly ever feel horrible, but I instantly felt like the worst person in the world. A modest dresser, I felt like a tramp all of a sudden. I couldn’t have felt more disrespectful! We already stood out like sore thumbs, but I remembered why I was there. Shanti, shanti, shanti. Peace, peace, peace. “Oh my gosh, we almost missed everything due to our shock!” I got back into the mindset that I created from a morning of yoga and meditation, lost the shoes, and wrapped up my shameful skin. Upon entering the temple, I cleared my thoughts, and then I didn’t even know where to start. Deities all around, up and down. Left and right. As we walked into the grand space Harish explained that we were surrounded by marble from Italy. He looked down and pointed to the floor that was inlaid with many different stones. He pointed to the artwork that was across the room, also inlaid with stone. Then it came to my awareness that people of this temple worshiped a particular guru. Rob led me to understand that this was built to all of the deities. However, everything on the walls of this temple was of this one particular guru. Our guide explained that “He is said to have mastered Hindu scriptures including the Vedas, the Upanishads, the Puranas, the Ramayana, and the Mahabharata by the age of seven.” (wikipedia) Our guide explained that he was at Ph.D. status by this age. I likened him to the Mozart of Hinduism. However you want to explain him, this guy (or to them, God) perked my ears. 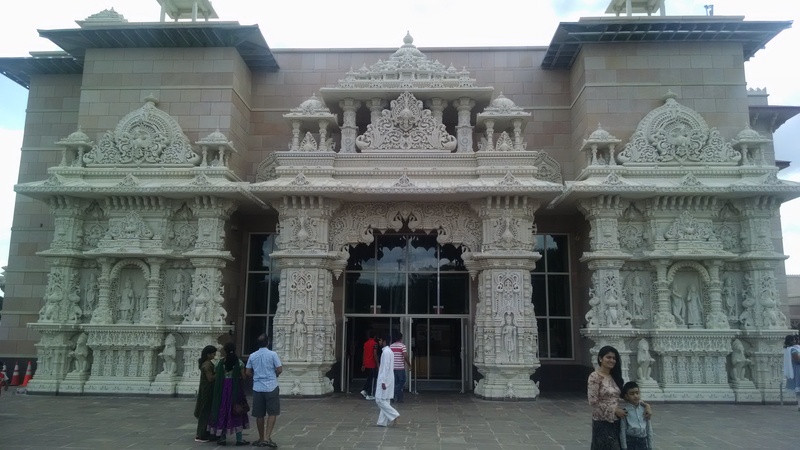 As we walked through the temple, I didn’t quite grasp Swaminarayan. Honestly, that didn’t happen until I came home and googled him. During our visit I stayed open to the Present Moment. As we parted ways with Harish, we felt like we were going to do something wrong, and we did. We walked to the right side, instead of through the left side. A guard stopped us, and kindly explained that it was a story line, and to follow it from the beginning. Actually, the end of the story did make more sense once I read the beginning! I was beginning to feel lighter. My boyfriend was definitely in a better mood than just an hour or so ago, so I knew this place had some power. I like what he then shared with me. While looking at the carvings he said, “You know, each piece in here has been blessed: by the people who made it, and by the people who consecrated it.” As soon as he said that my whole experience changed! Here, I had been walking around feeling open, but not connected. Like I said, I was eyeing the place in the woods. But to feel a spiritual presence, in stone, in lots of ornate stone, is much different than the living, breathing connection you can find in Nature. I instantly saw the hidden dimension of time and presence, and I felt a vibration surrounding me, and then penetrating me. I almost got emotional. Earlier, when we were walking around the gift shop, I noticed a boy with a symbol on his forehead. Then moments later, I saw the washable tattoo of the image. So I walked back over to the young woman and asked her what this symbol meant. (I later realized it’s their, The Baps, symbol!) She walked over to another carving of it and explained, “It’s a tilak-chandlo. 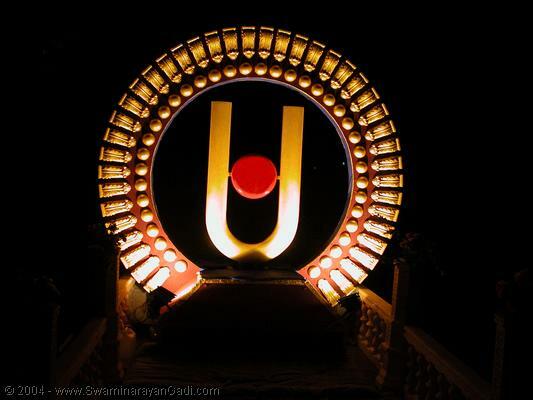 The tilak, the U, represents the lotus feet of God. 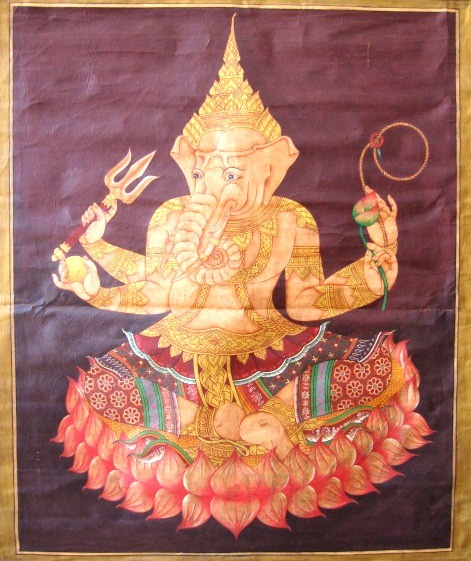 The chandlo represents the devotion of God. It symbolizes we have surrendered ourselves to His lotus feet.” She further explained that only the men can wear the U. Again, words cannot explain. The immensity. It was this meditative experience that changed my life forever, bringing my consciousness to a new playing Field, taking what I found on the inside, and seeing it on the outside. I spent months studying and practicing how to surrender myself to the moment with pure body and mind. So to be in a temple that was created in memory of someone who was born 234 years ago that knew of the same thing, felt like I’m still on the right path. Walking step by step in God’s Grace. Being open to each new experience about to take place. Next articleself-helpYou're So Thin! / You're So Rude!